Work Types are used to define the name, rates, and type of work being done by contractors in Payable. 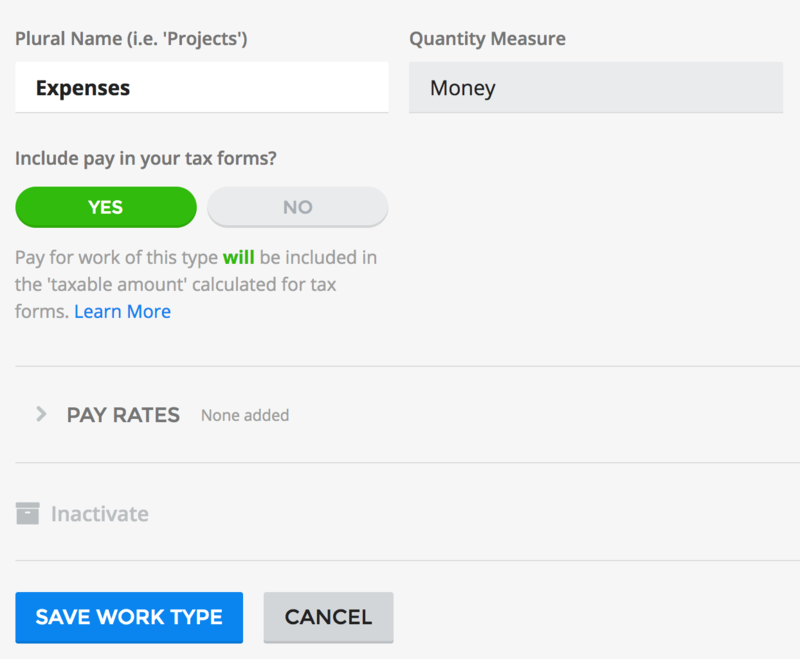 You can also set the taxable status of a Work Type. This allows you to configure how Payable treats this work when calculating tax forms at the end of the year. You can either include this work, or exclude it. We highly recommend consulting your Tax advisor or Accountant before making changes, as these choices affect the accuracy of the Tax Forms you provide to your contractors and the IRS. To configure your Work Type’s taxable status, go to the Lists Tab (#1), and select Work Types (#2). Your Work Types are listed. Select the Work Type to edit (#3), and the Work Types detail screen is displayed. Select correct setting for the tax treatment of the Work Type and click Save Work Type. You will be shown a confirmation dialog explaining the consequences of the choice you are making. Any changes may affect taxable totals on unfiled forms, which will be recalculated if needed, and all tax calculations going forward.